The most expecting day in October may be the Halloween, in which people will dress up their Halloween costumes and take special parties. You won’t get startled when brush against the “monsters”, “witches”, “ghosts”, “skeletons” and superheroes like batman and spiderman. Besides, there’ll be many cute elves pay visits on your door shouting “Trick or treat” loudly. Presently, the scary atmosphere of Halloween has been replaced with interesting and funny activities. To keep those scenes, many people would like to record their Halloween parties or create Halloween video. For this case, I will share some ideas to polish your works. Adding filters and effects is one of the ways to customize video, which reflect the atmosphere, topic and style of the video. The warm-tone filters and effects exhilarate people and come with some sweet dispositions. It’s recommended to add those filters and effects to make funny video for Halloween. As for making weird and scary Halloween video, the cold-tone and monochrome filters are suitable. The fear generally comes from depress and mysterious scene. The videos will be colored with different implications, if you can apply filters and effects flexibly. Subtitle and watermark are additional parts for video, which explain the plot, implication and indicate author’s attitude and statement. Therefore, many people love adding subtitles and watermark to make it more stylish. For those people who want to create Halloween video in a funny way, amusing subtitles and watermark are necessary indeed. Also, the watermark can also help you cover somethings irrelevant items that you do not want to be shown. Accelerating and slowing down playback speed can flash unnecessary parts and emphasize certain sections that you want the viewers to pay attention. Take a Halloween video I made for instance, I selected a certain section and slowed down the speed aiming to absorb viewers’ attention. For the next part, I speed up to the maximum suddenly for the appearance of “Zombie”. As was expected, this trick frightened most of viewers. Absolutely, it’s not recommended to use this trick too often, if you don’t want to be cursed by irate viewers. Above are the tricks for Halloween videos. To performs those jobs, you may check the following parts. Actually, this application is not only a program for downloading online streams, but features advanced editing functions as well. 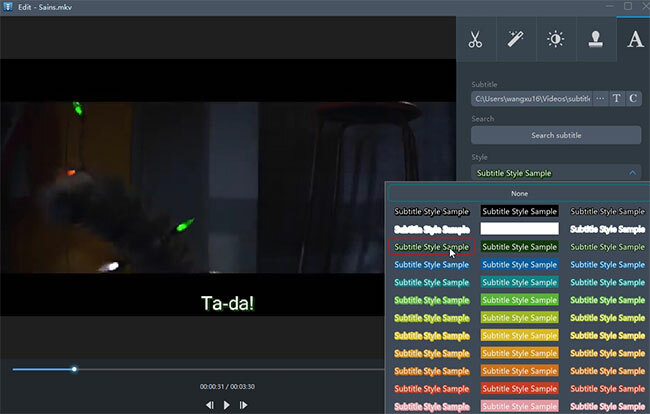 It comes with a video editor which offers multiple editing options for users to customize media file, such as adding effects, subtitle and watermark , adjusting playback speed and many more. 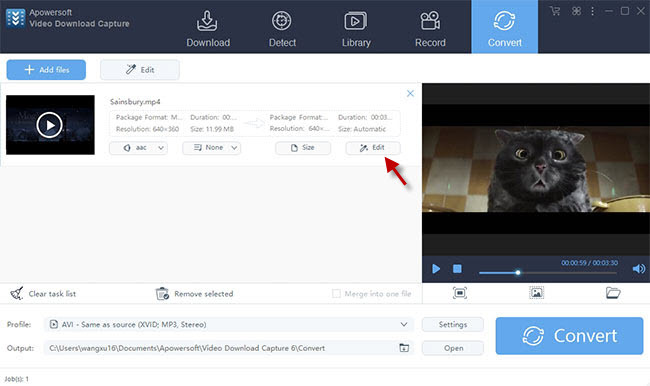 In addition, you can also use this application to convert the edited Halloween video file to any format you wish, such as MP4, MOV, AVI, WMV, etc. 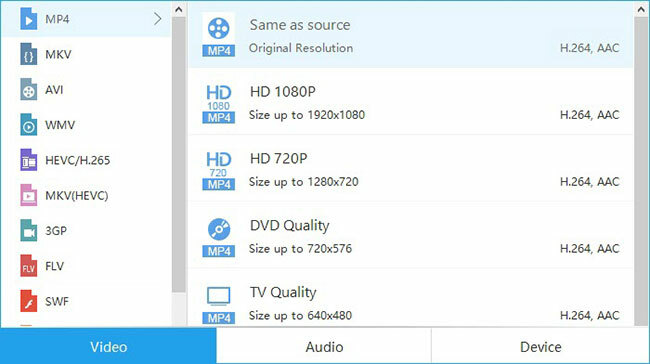 The format converting function can make your work compatible with most of media player. To learn how to make Halloween video with this tool, you may check the instructions below. Download and install Video Download Capture on your computer by clicking the button below. Launch the program and then go to the tab of “Convert”. Drag your Halloween video into the program and then click “Edit” button. Click “Effect” tab and then adjust the options of Contrast, Brightness, Saturation and Speed. Click “Profile” and then choose desired format in pop-up dialogue. The first step for this job is to prepare watermark and subtitle file and then add watermark and subtitle to video with editor. 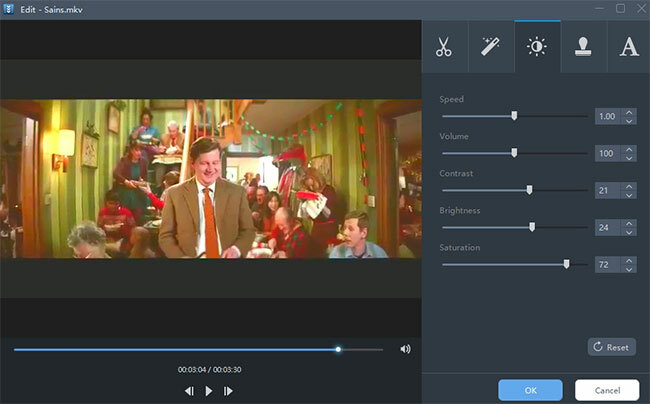 This application also empowers users to customize position, transparency for watermark and subtitle. Also, there’re multiple styles for subtitle available in video editor. 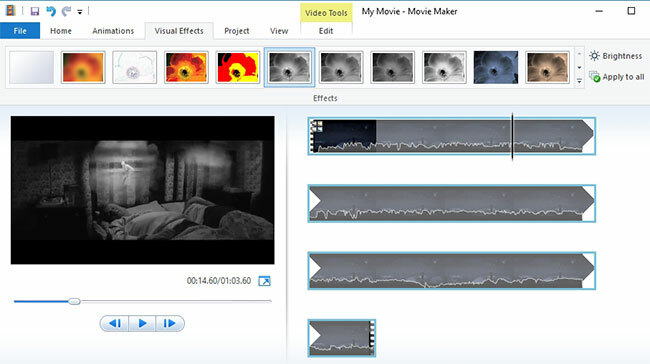 Windows Movie Maker is a simple video editor for Windows OS. With this application, people can add filters, subtitles and adjust playback speed for media file. It features an intuitive interface that allows users to operate this tool without any hassles. The basic steps about this tool are as below. Go to “Visual Effects” tab and then choose preferred filter. Press the options of “File” > “Save movie” > “Recommended for this project” to generate video. Both of those two applications are effective to make Halloween video, you can choose one that you like best.